TradeMaven is a cutting edge platform that combines powerful trading tools for both execution and analysis of the markets in real-time with fast and robust performance, and unlike many other industry platforms TradeMaven has no additional per contract software transaction charge. Through this industry leading platform Traders have access to multiple order entry interfaces, trade management tools, and extensive charting and indicator packages. This allows each trader to create custom layouts that meet their specific needs. The TradeMaven software is an all in one solution ideal for the active day trader, educator, systems trader, broker, and money manager. The software is available in Standard, AutoMaven, and Professional versions. 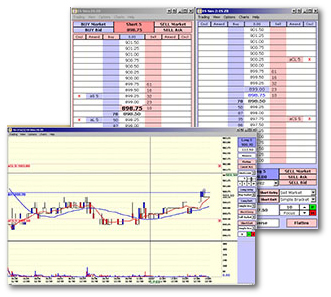 The Standard version of TradeMaven is a complete charting and trading platform. The software uses accurate real-time and historical data features, multiple order entry tools, including true drag and drop trading through the charts, customizable DOM style Trade Windows for the active day trader, unlimited simulation, complete and customizable charting indicators, and drawing tools. The Standard version also incorporates our enhanced market replay functionality. Replay and trade the markets for any time period, in real time or accelerated modes. Perfect for systems testing or trading instruction. AutoMaven comes with Strategy Builder, which allows you to automate trade entries and manage positions based on price and indicators found on your charts. AutoMaven can also execute trade signals from Tradestation and eSignal systems. All features available in the Standard version are included in AutoMaven. The Professional version software comes with sophisticated bid/ask analysis, market profile tools, and proprietary volume indicators. All features available in the Standard and AutoMaven versions are included in the Professional version. Place your own simulated trades in your own trading account. Your simulated trading account will be available to you for 1 week. Test your trading strategies and test TradeMaven without cost or obligation. Please provide the information below to receive your free access codes to enter the TradeMaven free demo internet web site. The demo is complimentary, and there is no obligation. This form must be filled out in its entirety to be processed successfully. Street Address Do you currently trade? If Yes, what do you trade? PLEASE VIEW THE ONLINE INSTRUCTIONS FOR USING THE POWERFUL TradeMaven. Feel free to call us toll free with any questions you may have. Copyright ⓒ 2005 LaSalle Futures Group. All rights reserved.